Cute! Adorbs! Awkward! Funny! All the light, fluffy, contemporary book feels wrapped into one lovely read! This book was great. There’s no getting around the fact that Simon is a lovable main character. His friends are sweet, his family is fantastic, and everyone in this book is just so bloody awesome! 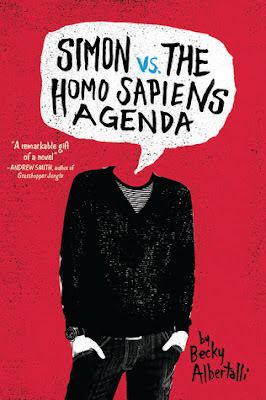 At first, it was kind of hard to read the book from Simon’s point of view. The way the book read was how Simon’s thoughts actually played out (or at least, that’s how I pictured it), so when I first started reading it was difficult to understand exactly what was happening, but then his voice just clicked and I was loving every thought he had. The way Albertalli dealt with the friend characters and other side characters of the book really had me smiling. I never disliked any of her characters, even ones who may have deserved some of my ire. They were all redeemable in my eyes and I think that that’s a great quality to give your characters. I think a lot of authors forget that these fake people are supposed to seem real, and sometimes human beings make mistakes. While I loved the characters of the book so very much, I thought that the plot of the book was just good. It was a little predictable. And the book was super short. I especially wanted some expansion on the ending. I think all Simon lovers will agree to that! I also have to say that the ending just seemed to wrap things up a little too nicely, as well as a little too quickly. However, the issues I had with the plot didn’t really detract from the love I felt for the characters and a lot of the book in general. 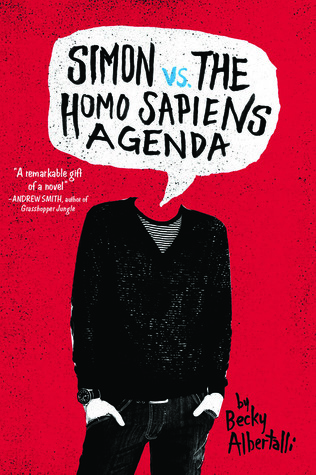 All in all, Simon vs. the Homo Sapiens Agenda is a must-read for anyone who wants to read a laugh-out-loud, feel-good contemporary book. You’ll smile, you’ll cry a little, and you’ll just plain enjoy yourself.